1. 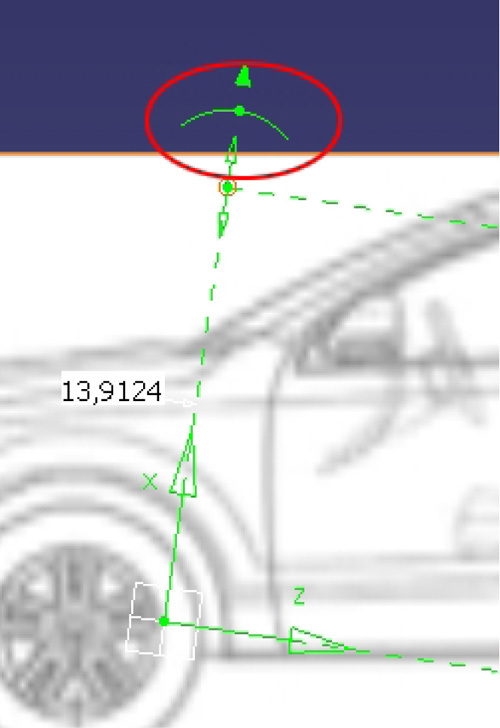 After downloading your blueprints, you'll have to cut each view individually from the original document with a picture/photo editing software, and save them as separate pictures (front view, right view, top view, etc). Though it's not mandatory to have exact dimensions on all saved pictures (however all view have to be on same dimensions), make sure that all views are well-centred on their own documents. To cut, you can use a photo editing software featuring a selection tool, e.g. MSPaint or The Gimp (free). 2. Once done, open CATIA. 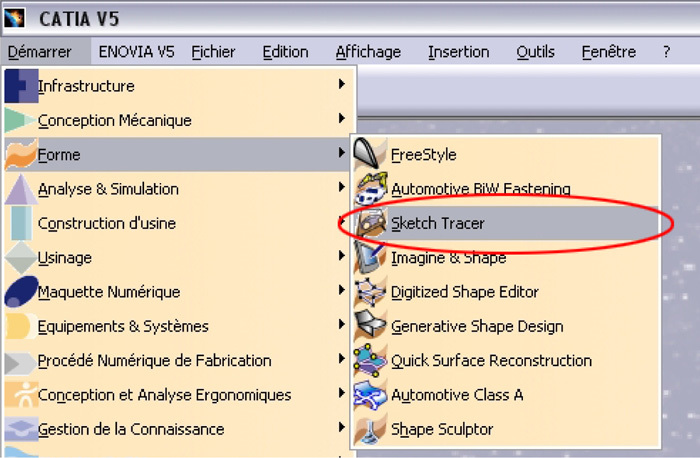 Then, go on the top left corner, and click on the menu Start/Démarrer, then select Shape/Forme (third line), and finally click on Sketch Tracer. This will open a new Assembly Design document called 'Product1'. 3. Make sure you are in Realistic Display Render View/Affichage en mode rendu réaliste avec texture. 4. In the Design Tree on the left, click on the first top line (by default : Product1). 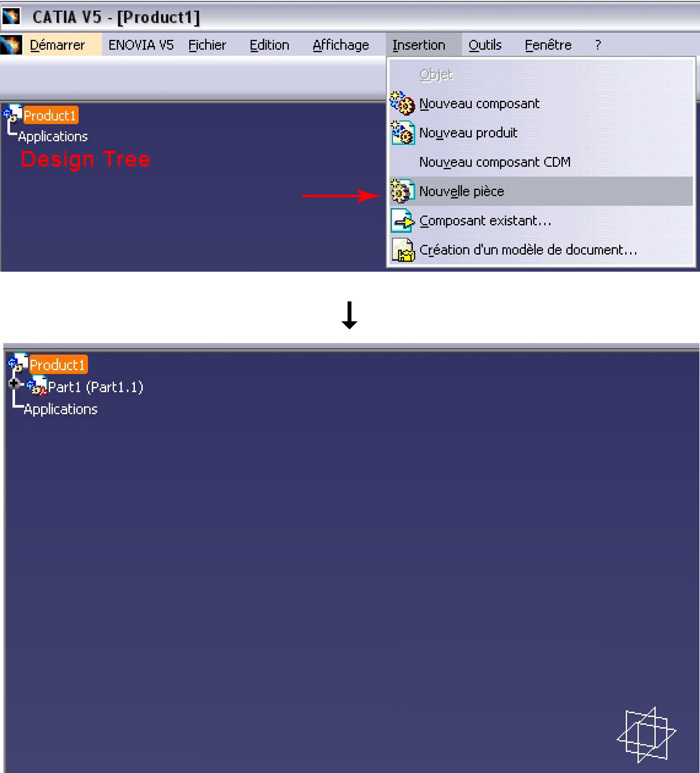 Then, select the Insert/Insertion menu and click on Insert Part/Insérer Pièce. This will create a new Part line, under the 'Product1' line, and make appears 3 planes and a Origin. 5. Now it's time to import your blueprints : select (click on) the plane on which you want to import one of the blueprints, and click on Normal View/Vue Normale; this will make your view perpendicular to the selected plane. 6. In the right toolbar, click on the icon Create a new immersive sketch/Créer une nouvelle esquisse immersive. 7. Select your picture in the window. 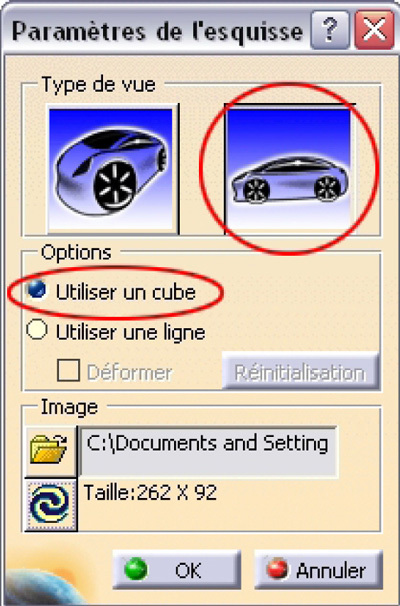 Then, choose Apply cylindrical view/Appliquer une vue cylindrique and Use a cube/Utiliser un cube. Then click OK.
8. Your picture is now imported. Use rotate green commands (see below) to make origin's axis match with picture's axis. Use the small filled green marked 'Zoom' (not Size/Taille!) to adjust size of a blueprint in relation to another blueprint. For the command to be effective, you must have at least 2 picture imported. Actually, when you doubleclick on a picture to resize it, the command will resize all other pictures, so each time you import a new picture, resize it before importing another one. The white 'Off' command lock the view perpendicularly to the selected picture. 9. Once origin is correctly oriented, move the origin onto the place you want (planes will be used to draw sketches). When picture is selected, moving your mouse on the edges of the picture will make appears white arrows : click and drag to move your picture along the plane normal. Next, repeat steps 5 to 8 to import other views. You can now double-click on the plane you want to draw on. This will open the Part Design studio. Use the Sketch/Esquisse icon and select a plane to begin drawing on it. 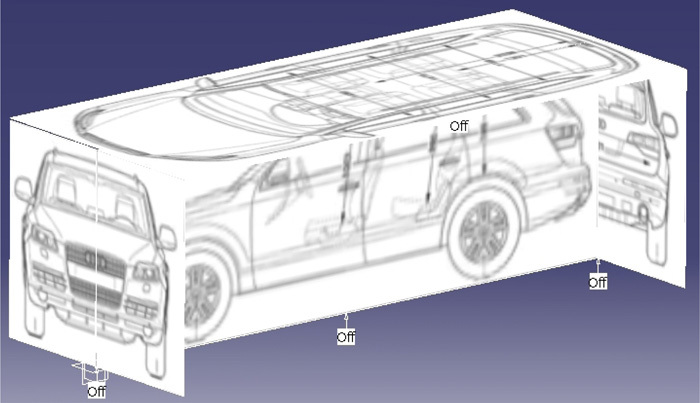 Last thing: when you'll save your work, don't forget that CATIA will save 2 files : - A .CATPart file, which contains your geometry (shape, scheme), actually all elements created under the Part Design studio (they're listed in 'Corps Principal', or in another Part Body. 'Corps Principal' is a Part Body). - A .CATProduct file, which contains the CATPart file, as well as extra parameters, such as your blueprints. Loading a CATProduct file will automatically load the CATPart file too. 1 : The main file ; its contains all elements. 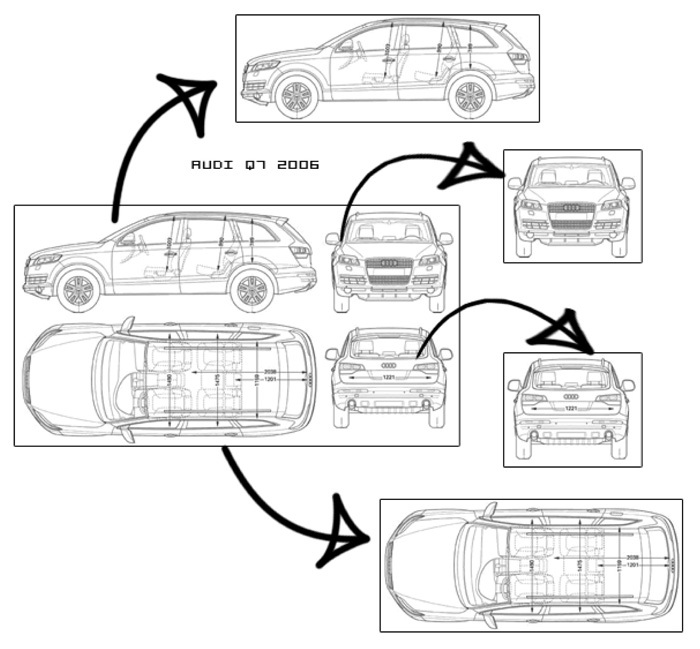 A Product is composed of one or several Parts, plus optional extra parameters. 2 : A split of the Product, which introduce a Part. This section is a kind of link between the Product and the Part, as it can contains extra parameters, such as constraints (parallelism, perpendicularity etc.) between the Product and the Part. 3 : The Part section itself : all tri-dimensional elements of the object you want to draw will be placed here, via Part Design studio. To have access to Part Design Studio, you can double click on any element contained in the Part section, either in the screen or in the Design Tree. You can create several Part Body (Insert/Insertion menu, then Part Body/Corps de Pièce) that act as layers : they can be hid (right click on it, and select Cacher-Afficher/Hide-Display) with all element contained in them. 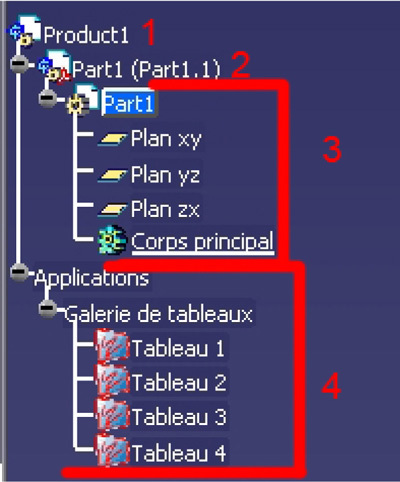 To activate a Part Body (creating in it) : right click on it, and select Define Work Object/Définir l'Objet de Travail. 4 : Extra parameters contained in the CATProduct file (here, all blueprints). This work is protected by a Creative Commons License.